Nirvanna the Band the Show is a peculiar little mockumentary show about two lifelong friends whose main goal in life is to play a show at the famed Toronto bar, The Rivoli. But, like any good show, the main goal is only a starting point. The real meat of the show is watching these two friends scheme and fail repeatedly in increasingly humorous ways. It originated as a web series before the Toronto based television network, Viceland, expanded it into a full TV series. The style of the show is that of a mockumentary, not terribly dissimilar to The Office, though without the frequent “talking heads.” Both of the main characters remain fully aware of the cameras and even acknowledge the people behind them on occasion, but it never comes off as a clone of the Office/Parks and Rec style. That’s thanks in large part to the semi-scripted nature of the show that sends these actors out into the real world to put on their show in the midst of an unsuspecting crowd. In fact, some of the show’s best moments involve watching the real reactions of the people who didn’t realize they were witnessing the filming of a show. Part of the wonder of what’s been achieved here is trying to figure out whether or not they had permission to shoot where they did and whether or not the people they interact with were in on it. On the outset, two bandmates looking for their big break may sound similar to Flight of the Conchords, and maybe they owe a bit to that show for inspiration, but the music here plays a very minor role. Jay is the quiet, reserved, piano player, who gets to show off his talent from time to time, but Matt is the one with the outgoing entrepreneurial spirit, even if he doesn’t necessarily have any musical talent to offer. He does, however, bring a boisterous energy to the show and is the brains behind many of their schemes. As for those schemes, they include ever increasingly complicated attempts to make a name for themselves in order to impress The Rivoli. It starts with an attempt to advertise themselves with band photos and goes as far as having them try to shoot a film and sneak it into Sundance. The show nearly plays like a live action cartoon akin to Pinky and the Brain or Wile E. Coyote as the central characters come up with what they’re sure is an ingenious plan to accomplish their goals. Then we watch as everything goes horribly wrong, and usually in front of a large crowd of curious onlookers. Like so many sitcoms that have come before it, there is a clever use of the familiar formula that involves the setup, more setup, and bringing it all together in one hilarious punchline. And maybe because they owe so much the shows that inspired them, the show is full of references to Jay and Matt’s favorite movies and TV shows. From references to everything from Jurassic Park, Home Alone, Seinfeld and other TV shows and even video games, part of the fun is being in on their geek culture jokes. In fact, the show feels written specifically to appeal to people who grew up in the 90’s, which might explain why I’m so drawn to it. 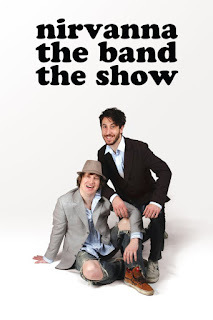 While shows in which people continually fail can become painful to watch if not handled the right way, Nirvanna the Band the Show survives on the likability of the two leads. Matt Johnson and Jay McCarrol aren’t just funny, they’re fun to be around, and when they do inevitably fail, the show never turns dour. You can’t keep these two down for long. Certainly, the show isn’t without emotional payoff, but the two are so high spirited that there’s a sense of optimism even during their low points. Rarely do shows come along that break the mold in such a compelling way. Somehow it manages to feel like other shows you know and love, but also like nothing you've ever seen before. I knew I was going to love the show after seeing the first episode. In fact, I liked it so much I marathoned the entire 8 episode season in one night. Even if this ends up being the only season we get of this show, the joy it brings watching these hilarious shenanigans is well worth the price of admission.